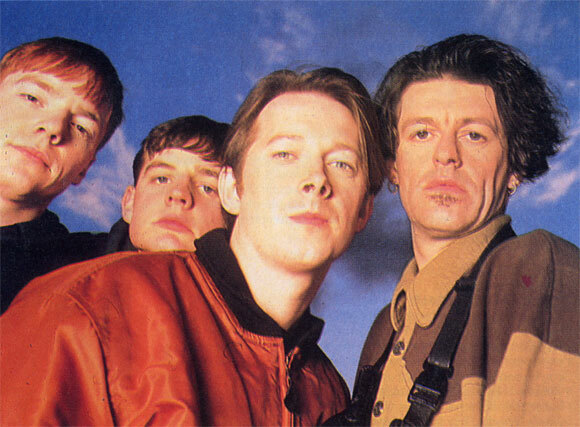 808 State Article: Spin off: 1990 And All! I Am Not A Number! Spin off: 1990 And All! I Am Not A Number! "Who's for a pill, then?" queries Ron, 808 State's rather large manager. He's clutching several bottles of brightly coloured tablets, busily dispensing them to each member of the group. "Give us a green one, Ron," quips Darren, one of the group's DJs, leering across the table determined to get his quota. As everyone clutches a handful of multi-coloured pills, the headlines loom large. Almost disappointingly, they turn out to be "vitamins" to "keep their strength up". So much for the scandal angle. It's the morning after 808 State's second Top Of The Pops appearance, and the group look out of sorts in the plush hotel surroundings. They not only stand out in terms of appearance, but also in terms of music and commitment to the dance music scene. Martin Price, Graham Massey and DJs Andy and Darren have been on the Manchester scene since the year dot. They met, by chance, in Martin's Eastern Bloc record shop around the time that "acid" was becoming a household word in Britain. And so, the State was born. Graham: "It's just a weird combination of four different people from different backgrounds and all of that comes out in the music. I think that's why we've got such a unique sound on record." Due to the seemingly overnight success of 'Pacific State' and the deal the group struck with ZTT, 808 State are also the proud deliverers of a new album, 'Ninety', at a time when dance music traditionally makes way for the likes of Richard Clayderman and Phil Collins albums. "It was a bit of a rush for us to get it together," explains Martin, "But it paid off. I think the album's benefited from the conditions we had to do it in. The mix of material is strange as some of the tracks are over a year old and some are brand new. We brought them all up to date in terms of what's happening now." Listening to the album, you'd think it was a perfectly normally prepared, beautifully finished artefact of new dance styles. Surprisingly, it took a frantic six days to put the whole thing together. Graham: "At times it was torture. Some tracks went really smoothly and others didn't, with everyone fighting to get their own bits onto the record. But that kind of conflict never does any harm." True enough, with the end result boasting some vibrant rhythms and a real charmer in 'Cobra Bora', tipped as the next single. "It puts Rhythm Is Rhythm in the shade." exclaims Martin. But it hasn't all been that easy. Parts of the media have compared them to new age house music and on their Late Show appearance the production team wanted to show pictures of Stonehenge behind them. 808 State were not impressed. Graham: "Our music hasn't just got one mood to it. There's no way you could call it new age house." Martin: "A lot of people have attached that kind of image to raves as well. It's all just a marketing ploy." Although the album contains a couple of mellow tracks, 808 State are a long way from new age house (whatever that is!). With music styles as diverse as ethnic and acid, they've got more of a punk attitude than that of a hippie. Even to the point of not really wanting to be famous. Darren: "We're not stars. As long as you've got enough money to be able to eat and your music then that's enough. I mean, we're not exactly an image band... Who'd put a poster of us four ugly bastards up anyway?"